Happy Thursday! I am so glad you stopped by! We're getting soooo close to the launch of the 2017-2018 Annual Catalog! OH-EM-GEE! 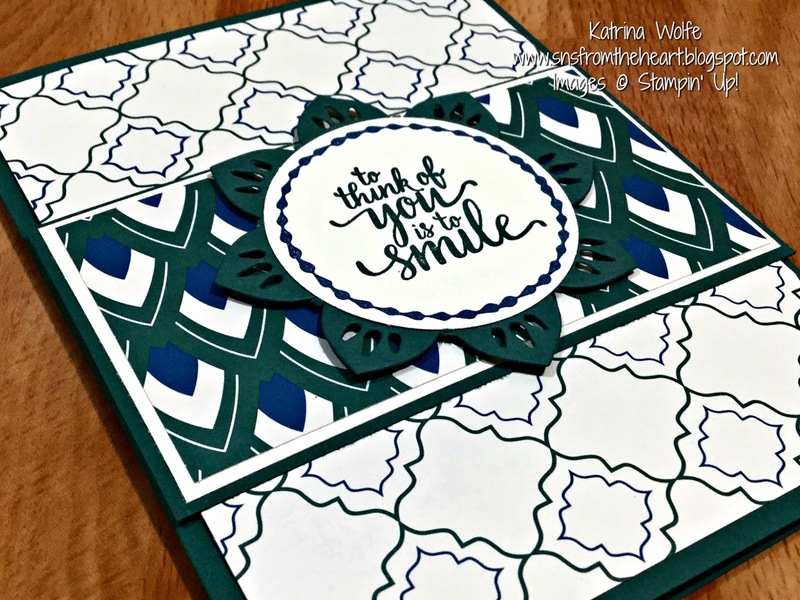 I can barely contain myself and CAN NOT wait to be able to order beyond the limited pre-order selection Stampin' UP! allowed us demonstrators to get ahead of time. Trust me, that alone makes it sooo worth being a demo...because lets face it, being able to order a little bit is far better than not being able to order at all; well at least that is my theory...don't laugh, I can't help myself...who knew picking up a rubber stamp would lead to such an addiction? The Tranquil Tide is such a soothing color and it pairs beautifully with Dapper Denim. The sentiments in this set make it pretty versatile and the font used is just beautiful. 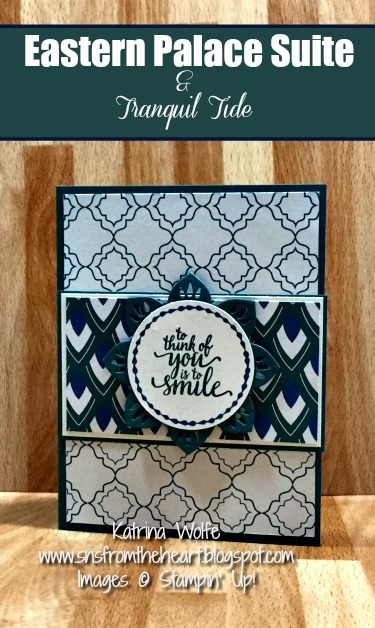 I began with a standard card base of Tranquil Tide cut 8.5" x 5.5" scored and folded at 4.25". I layered a piece of the Eastern Palace DSP cut 5.25" x 4" and a second piece of Tranquil Tide cut 4.25" x 2.375" (2 3/8"), Very Vanilla 4.125" x 2.25" and a second piece of DSP cut 4" x 2.125". I then cut a piece of Tranquil Tide using the flower shaped die (this die does a partial cut, so I then used a circle framelit to fully cut it away from the cardstock and the removed the remaining paper from between the "petals". I stamped the sentiment in Tranquil Tide ink onto scrap Very Vanilla and the dotted circle image with Dapper Denim ink and punched it out using the 2" circle punch and adhered it to the "flower" and attached this to the card using dimensionals. Let me know your thoughts about this card. I would love to hear them, so please leave a comment below and I will be back soon with more sneak peeks into the awesome new catalog!